Much bigger plenum chamber (2nd stage chamber is 5 times than 1st stage chamber) ensures Outlet pressure stability and Steady flow of gases. 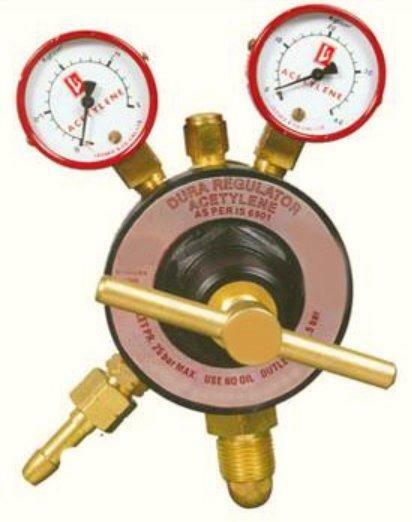 BODY: Forged Brass , tested at pressure 1.5 times of cylinder pressure to prevent dangerous bursting. It stands the most rugged condition absorbs and dissifates quickly the heat caused by opening of the cylinder valve. SAFETY VALVE: Ensure prevention of dangerous pressure built up discharges pressure quickly and then reseals when correct operating conditions are restored. SAFETY DIAPHRAGM: Stainless Steel in 1st stage to stand on full cylinder pressure and Neoprene in 2nd stage to backing up the safety relief valve. It burst in case excess pressure built up. BONNET: Super tough high strength die cast alloy materials ensure outlet pressure stability, steady flow of gases, gives flexibility and better pressure regulation. VALVE & VALVE SEAT: SS valve pin and fire retardant valve material ensure guarantee accuracy of pressure and constant gas flow. INLET FILTER: Dust proof sintered filter prevents foreign matter entering into regulator, reduce velocity of gas, prevent fire.